The Bluegrass Blog » Charlie Louvin benefit in Bell Buckle: News at the speed of bluegrass! A benefit concert has been scheduled for October 30 to help defray medical expenses for Charlie Louvin, who is being treated for pancreatic cancer. Charlie is, of course, half of the legendary Louvin Brothers who had a string of hits in the the 1950s and early ’60s including When I Stop Dreamin’ I Don’t Believe You Met My Baby, You’re Running Wild and My Baby’s Gone. Though not recorded originally in a purely bluegrass format, many of their classic songs have been covered by bluegrass artists like Alison Krauss, The Osborne Brothers and Rhonda Vincent. His brother Ira did in an automobile accident in 1965, putting an end to their successful partnership. Charlie has never stopped performing, but his diagnosis in July of a Stage 2 cancer has throw a curve to the 83 year old music business veteran. A surgical treatment was tried in August, but was unsuccessful. He has been facing mounting bills for his current medical care, which his friends in the bluegrass world mean to address. The October 30 event will be held at the Bell Buckle Banquet Hall about 5o miles south of Nashville, and will be hosted by Valerie Smith & Liberty Pike and Charlie himself. There will be music from noon to 9:00 p.m., with an auction running from 2:00 to 5:00. — The concert will feature performances by Santara Wind, Homespun Bluegrass and others. Cost is $7, $6 for members and free for children under 12. Rural Rhythm Records is very proud to announce the new radio single release, “Bring Back Yesterday” by Grand Ole Opry performer, Bobby Osborne & The Rocky Top X-Press. 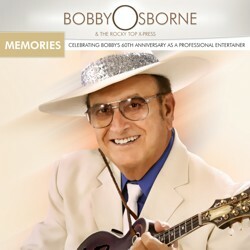 The song is from the upcoming November album release, Memories: Celebrating Bobby’s 60th Anniversary as a Professional Entertainer. The new bluegrass music album showcases Bobby’s one-of-a-kind lead vocals and that familiar sound of the legendary Osborne trio. Mason Dixon Bandits and the Water Gap Band will be at the October 3 Shindig of the Pocono Bluegrass and Folk Society. It’s at the Elks Lodge in East Stroudsburg, Pa.